Debate: For A Better Future, Live In A Red State? Some argue that red-state tendencies toward lower taxes and less regulated, more free-market systems make them ideal places to work and raise a family. But others counter that blue states are wealthier, offer more educational opportunities and are committed to a social safety net. Debate: For A Better Future, Live In A Red State? When it comes to things like the economy, taxes, health care and education, is it better to live in a red state or a blue state? Some argue that red-state tendencies toward lower taxes and less regulated, more free-market systems make them ideal places to work and raise a family. But others counter that residents of blue states are wealthier, have more educational opportunities and benefit from a commitment to a social safety net. 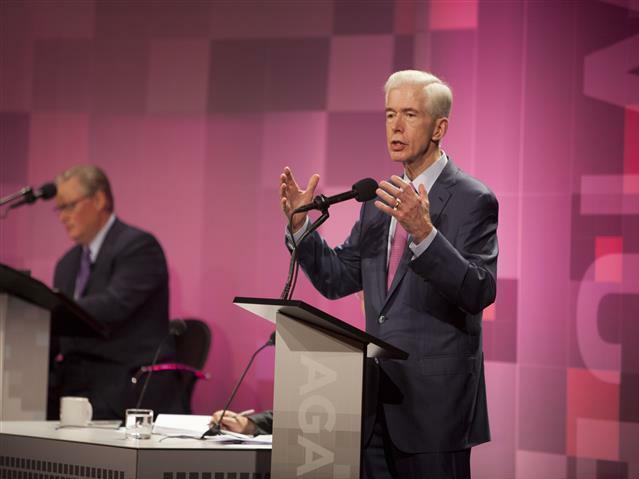 A group of experts — including conservative radio host Hugh Hewitt and a former governor of California, Democrat Gray Davis — recently faced off on this topic in an Oxford-style debate for Intelligence Squared U.S. They argued two against two on the motion: "For A Better Future, Live In A Red State." Before the debate, the audience at the annual meeting of the Philanthropy Roundtable in California voted 54 percent in favor of the motion and 24 percent against, with 22 percent undecided. After the debate, the support for the motion "For A Better Future, Live In A Red State" increased to 73 percent, with 23 percent opposed. That made the side arguing in favor of red-state living the winners. 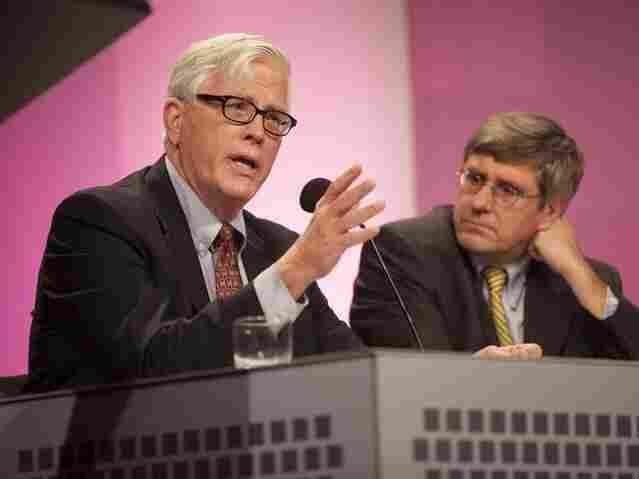 Hugh Hewitt is a lawyer, law professor and broadcast journalist whose nationally syndicated radio show is heard in more than 120 cities across the U.S. every weekday afternoon. Hewitt has been teaching constitutional law at Chapman University's law school since it opened in 1995. He is the author of a dozen books, including two New York Times bestsellers. Hewitt writes daily for his blog, HughHewitt.com, and is a weekly columnist for The Washington Examiner and Townhall.com. Hewitt served for nearly six years in the Reagan administration in a variety of posts, including assistant counsel in the White House and special assistant to two attorneys general. He lives in Southern California. Stephen Moore joined The Wall Street Journal as a member of the editorial board and the senior economics writer in 2005. In March 2013, he became a Fox News Channel commentator. He is the founder and former president of the Club for Growth, which raises money for political candidates who favor free-market economic policies. Moore has served as a senior economist on the congressional Joint Economic Committee; as a budget expert for the Heritage Foundation; and as a senior economics fellow at the Cato Institute. He was a consultant to the National Economic Commission in 1987 and the research director for President Reagan's Commission on Privatization. Moore is the author of six books, including Who's the Fairest of Them All? : The Truth About Opportunity, Taxes, and Wealth in America (2012). Former California Gov. Gray Davis argues against the idea that people are better off living in red states. Joseph "Gray" Davis was the 37th governor of California. As governor, he signed legislation aimed at strengthening California's K-12 system by establishing the Academic Performance Index to increase accountability in schools, and worked to expand access to higher education with scholarships and college loans. Davis also funded and established Institutes of Science and Innovation in partnership with the University of California and private industry. Today, Davis is of counsel at Loeb & Loeb LLP; a member of the bipartisan Think Long Committee; a senior fellow at the UCLA School of Public Affairs; and honorary co-chair of the Southern California Leadership Council. He has also served as lieutenant governor, state controller and state assemblyman. He began his public service as a captain in the U.S. Army, earning the Bronze Star for meritorious service in Vietnam. Michael Lind is a co-founder of the New America Foundation in Washington, D.C., where he is the policy director of its Economic Growth Program and Next Social Contract Initiative. A columnist for Salon, he has been a staff writer or editor at The New Yorker, Harper's Magazine, The New Republic and The National Interest and contributes frequently to The New York Times and the Financial Times. He is the author of a number of books of history, political journalism, fiction and poetry, including Land of Promise: An Economic History of the United States (2012). Lind has taught at Harvard and Johns Hopkins universities. He is a fifth-generation native of Texas, where he worked for the state legislature.